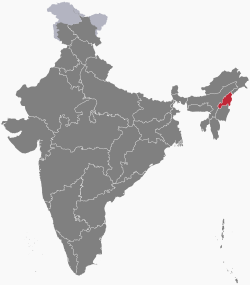 Nagaland /ˈnɑːɡəlænd/ is a state in Northeast Indie. It haes a aurie o 16,579 square kilometres (6,401 sq mi) wi a population o 1,980,602 per the 2011 Census o Indie, makkin it ane o the smawest states o Indie. ↑ "Shurhozelie Liezeitsu elected as new Nagaland CM". The Indian Express. Nagaland. 20 February 2017. Retrieved 20 February 2017. This page wis last eeditit on 24 October 2017, at 22:27.